Book reviews, usually written whilst sipping coffee, wrapped in a warm blanket. Goodreads Summary: This is the way the world ends... for the last time. A season of endings has begun. It starts with the great red rift across the heart of the world's sole continent, spewing ash that blots out the sun. What did I think? 4.5 Stars, most likely. Though not far from a full 5 Stars. 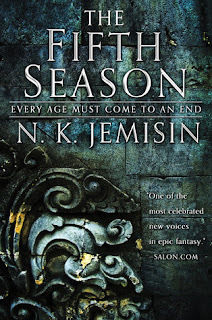 The Fifth Season is unlike anything I've read in a long time. A perfect blend of science fiction and fantasy with a fascinating world. The prose is very pretty, the world building interesting and the characters enticing. It's been a while since I've read a book where I liked everything. All POV characters (three female protagonists), the setting, the story and the prose. 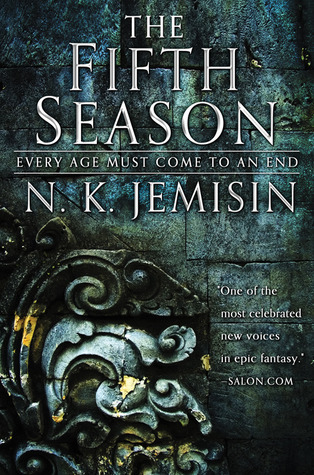 It took me a few pages to get into Jemisin's style, especially the chapters told in the second point of view. I didn't think it would work. In fact when I saw that Jemisin had written part of it in present tense and used the second point of view, I almost didn't pick it up. But it works. The world building and magic system are both well developed and interesting. In this world some people are Orogenes and they can control seismic activity and hence move mountains, create earthquakes or even still earthquakes. Because humans fear the unknown the Orogenes are feared and often killed or trained and treated as slaves. I think The Fifth Season is best enjoyed going in blind. If you're confused at first, don't worry, it'll all come together and if in doubt use the glossary at the end of the book. I read this as part of the fantastically diverse read-athon that Uma put together over @ Books.Bags.Burgers and I know I'm late by now, but I don't care. I have a few more I want to read even if it takes me all of 2017. Definitely a great one for any fantasy fan! I definitely want to read this one - it's been on my TBR for a while! Now your review has me even more curious and I can't wait to check it out! P.S I'm still reading books from my read-a-thon too! Ha ha. I'm in my 30s and when I don't train dogs or cook, I'm either writing or reading. Usually reading. At times you may find me on a bike or wearing running shoes, both things mostly so I can eat what I cook without breaking the scale. If you find any mistakes in my posts you're welcome to keep them or correct me. English isn't my first language and I like to improve. Books in Blankets. Ethereal theme. Powered by Blogger.